Mitashi Game-In Thunderbolt (Android), Android Touch Screen Hand Gaming Console, Download and Play 8-bit, 16-bit, 32-bit Graphic Games, Support Applications: MSN, Skype, Youtube, Map, E-mail, Facebook, Android Market and Play Store etc..
Mitashi brings you the first Android Based gaming console in India. 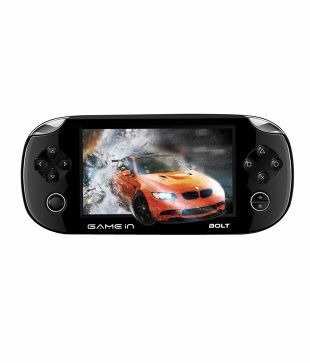 The device is packed to the hilt with unique and exciting features which ensures superior and comfortable gaming experience coupled with brilliant graphics and improved connectivity. The Mitashi Game-In-Thunderbolt comes with a lot of Android games bundled in to the system. It also comes with various emulators for popular video game consoles including GBA (Game Boy Advance), MAME (Arcade Machines), MD (Mega Drive), N64 (Nintendo 64) and NES emulator (Nintendo Entertainment System) for the perfect all-round gaming experience. To Recieve updates and possible rewards for Mitashi Game-In Thunderbolt please sign in. To Recieve updates and possible rewards for Gaming Console please sign in.